The Philippines is an underrated country that is becoming popular among seasoned and rookie backpackers. Not within easy reach unlike neighbouring countries such as Thailand, Cambodia, Vietnam, it usually takes patience and an open eye for a traveller to appreciate the beauty of the Philippines. Truth be told, Philippines is usually skipped by travellers for several reasons. Location wise, it is quite inconvenient to go around it being an archipelago and price-point wise, it is not as cheap as its Southeast Asian counterparts. 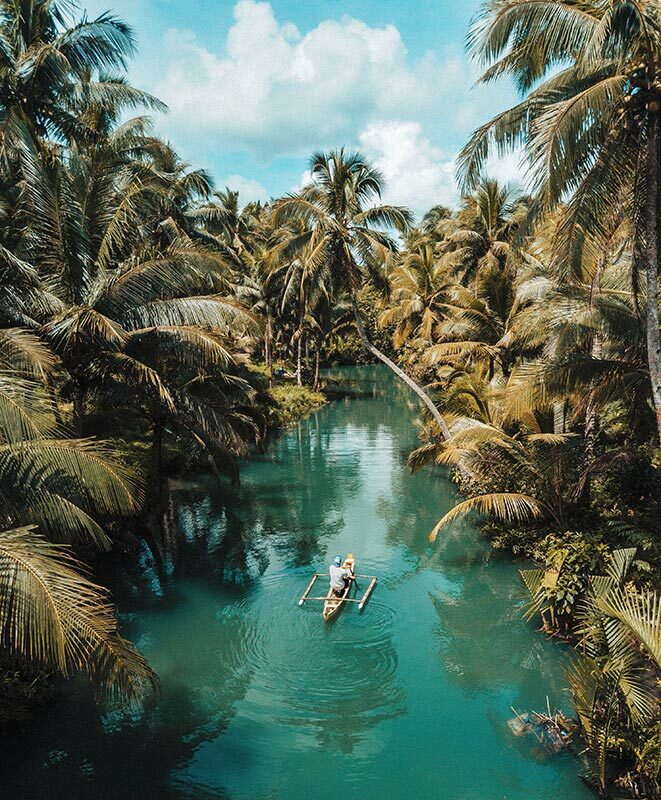 Despite this, Philippines is still an incredible place to visit as it boasts stunning scenery, unspoiled beaches and lush tropical greenery. If you’re planning to pay this Asian country a visit, then keep reading. Here are top and incredible places to visit in the Philippines. Boracay is a crowd favourite since word of its powdery white sand and crystal blue waters. Formerly known as the Ibiza of the Philippines as it used to be a non-stop party place, this island is now unquestionably an epitome of peace and quiet. 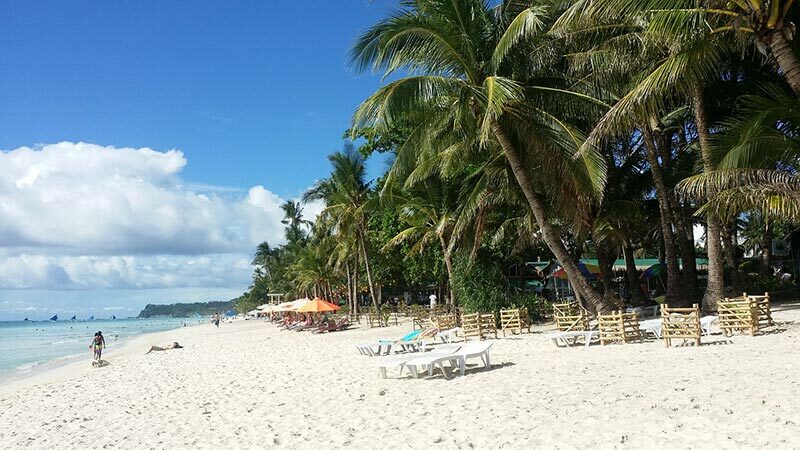 It is no secret among the travel community that Boracay island was shut down by the Philippine government so it could undergo major rehabilitation last year. The government’s avowed mission is to bring back this slice of paradise to its former glory. Fast-forward to end of 2018 there are now stricter policies to ensure sustainable travel in the island. Including daily limits on visitors and a ban on the single use of plastics. A lot has changed on the island and those changes were definitely for the better. Gone are the days when tourists were bombarded by loud sound systems from neighbouring establishments. Boracay is slowly bringing back the slow-paced life of a well-deserved vacation, and now holiday-makers and paradise-seekers can enjoy the unadulterated beauty this tropical paradise. To visit fly to Caticlan airport or Kalibo airport from Manila. 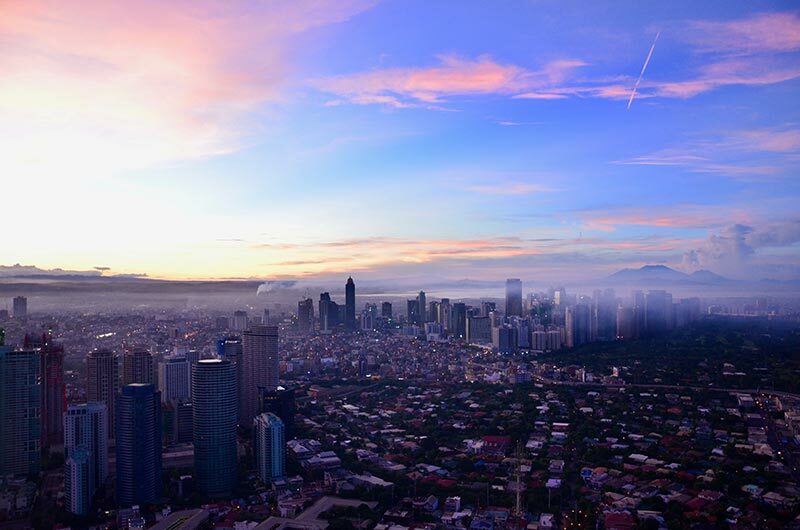 Manila has a notorious reputation for its chaotic traffic condition with hundreds of buses and jeepneys plying through the busy streets of this concrete jungle, but still, Manila is a diamond in the rough. For a quick culture fix, head over to the walled city of Intramuros and soak in its predominant Spanish colonial vibe. With its well-preserved ancestral houses and cobblestone streets, you will effortlessly be transported back in time. While in Intramuros, don’t forget to take a kalesa (horse-drawn carriage Philippine style) ride. After your day tour in Intramuros why not satisfy your hunger and fill your tummy with good Chinese eats at nearby Binondo? Binondo (also known as Chinatown) is teeming with various restaurants offering authentic Chinese food. Dubbed as the Last Frontier of the Philippine archipelago, Palawan is the truest definition of the authentic island life. Among its best destinations is El Nido, a quaint beach town fringed with majestic limestone karsts off the tip of Palawan mainland. Whatever your budget is, El Nido has you covered with five-star resort hotels offering lavishly appointed amenities to medium-ranged hotels down to budget backpacking hostels. You name it, there are plenty of accommodation choices in this Palawan town. For beach-goers and sunbathers, Las Cabanas and Nacpan beaches are your best bets. 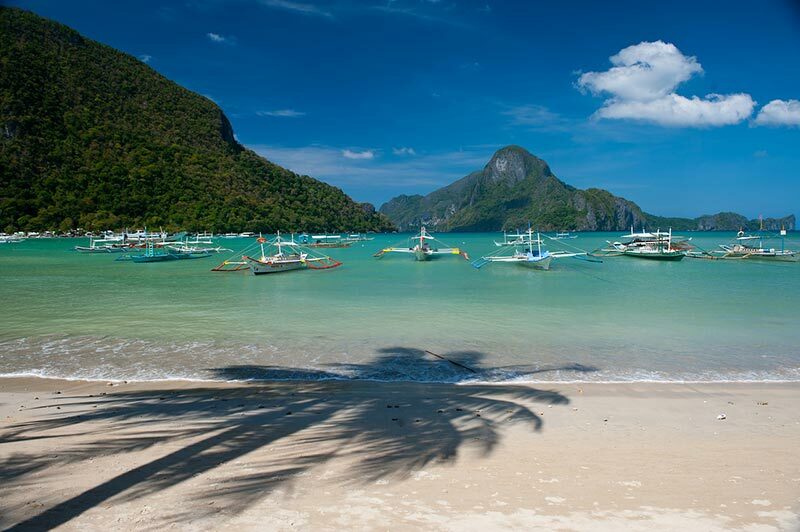 Be sure to lather enough sunscreen to avoid sunburns as sunbathing is an addictive activity in El Nido. Sunset lovers might also want to spend their afternoon sipping their ice-cold pina colada, or their favourite fruit shake while watching the sun go down! 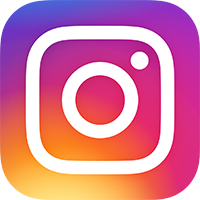 Make sure to get your cameras ready as El Nido sunset is only as good as it can get so share those Instagram worthy stories and make your IG friends green with envy. Lastly, don’t forget to add island hopping to your to-do list while in El Nido. There are several tours that you can choose from. Called Tours A, B, and C.
Tour A includes Small Lagoon, Big Lagoon, Secret Lagoon, Shimizu Island and Seven Commando Beach. Tour C is comprised of Matinloc Shrine, Helicopter Island, Secret Beach, Star Beach and Hidden Beach. 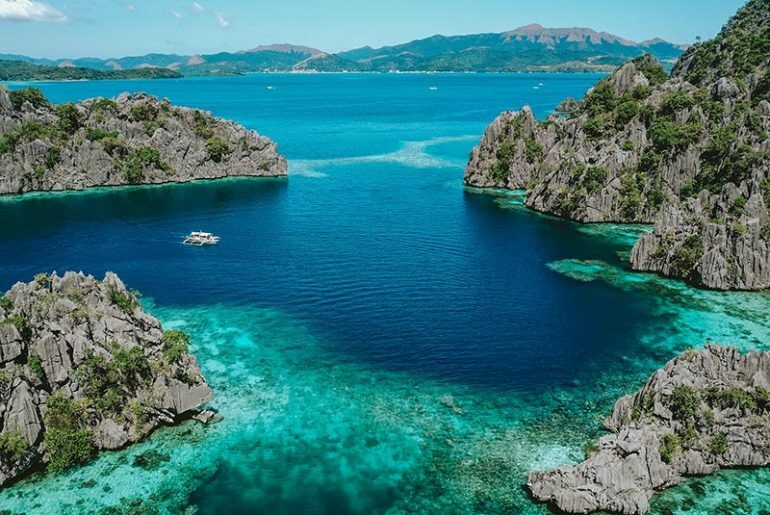 Coron is the twin sister of El Nido. From El Nido, Coron is easily accessible via fast-craft. 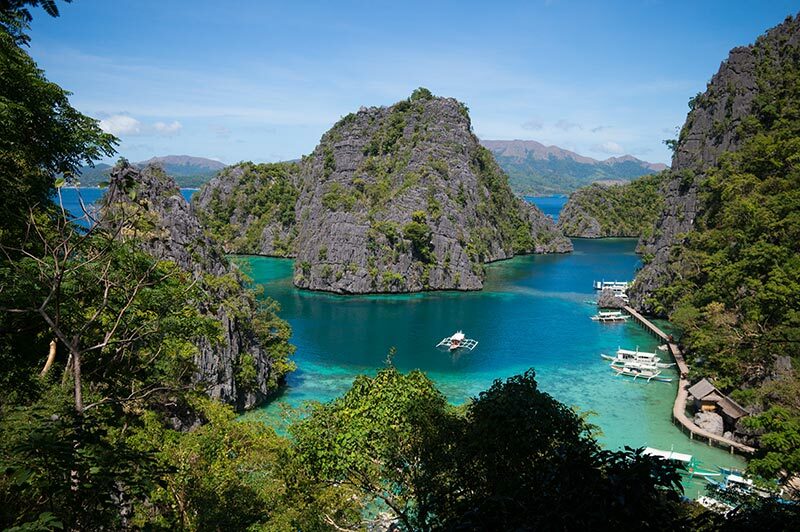 Coron is as beautiful as El Nido but has its own distinct charm. Its lagoons and turquoise blue waters are inviting, and you might mistake Coron as a place coming straight off a fairy tale book. It’s that beautiful. Try getting a taste of Coron minus the beach by hiking up Mt. Tapyas. Upon reaching the top, you’ll be humbled with a wonderful view such as the sun slowly kissing the sea and fading into the background while the sky steadily envelopes in incredible colours. It’s that kind of memory that will get burned in your head and you’ll thank yourself later on for including the Philippines in your ASEAN trip. Another to kick off your travel bucket list is the postcard picture perfect Kayangan Lake (seen below). Dubbed as the cleanest lake in the Philippines, Kayangan Lake is undeniably the face of Coron. Enjoy by going for a dip or taking a bamboo raft ride. For diving enthusiasts, check out several shipwreck spots dotting the island of Coron Bay. 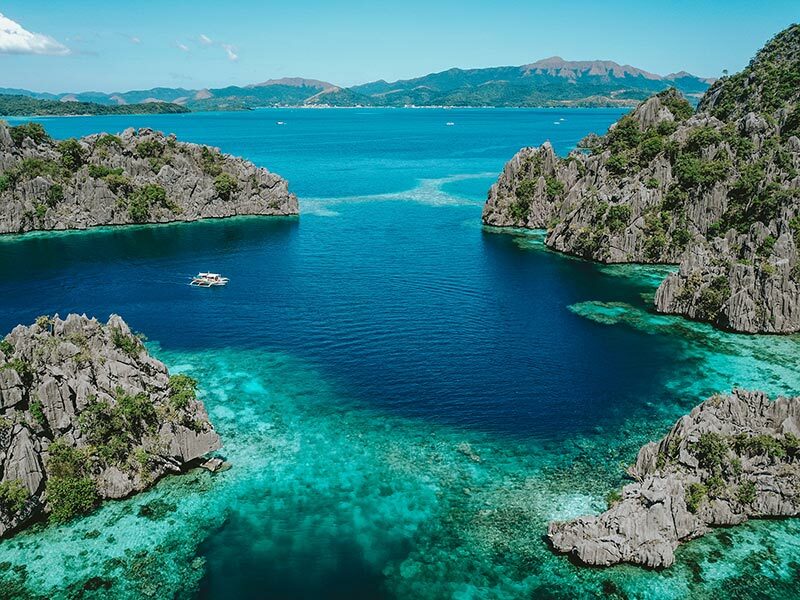 Coron Bay is well-known for its sunken Japanese wartime ships thus making it an ideal place for recreational shipwreck diving. Siargao, a coconut-filled island in Mindanao is making a name for itself. Aside from being a renowned surfing destination, Siargao has a lot to offer on its plate. An Island hopping tour is limited to three distinct islands: Naked, Daku and Guyam. These islands are only a short boat ride away from the mainland of Siargao meaning you can easily cover these gems in just half a day. Another sweet spot worth visiting in Siargao is the famous Magpupungko Rock Pool. This is an hour and a half’s drive from the touristy area of General Luna. The tidal pools are best enjoyed during the low tide season as the enclosed crevices create a natural infinity pool, inviting you for a swim. Tayangban Cave Pool is also worth mentioning. It is a newly discovered place filled with sparkly turquoise coloured water, perfect for a relaxing dip. The water in the cave pool is pleasantly lukewarm thus swimming to your heart’s content is highly encouraged. Bohol is home to the famous Chocolate Hills and adorable tarsiers. 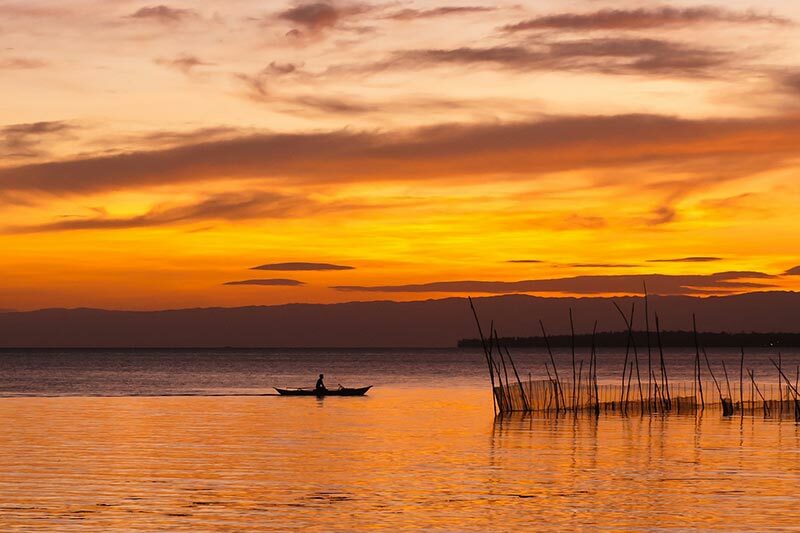 As well as this Bohol has a number of layers that you have to peel open to truly grasp its beauty? For beachcombers, Bohol is abundant with a number of beaches that you can explore. Alona Beach in Panglao Island is no exception. Its long stretch of powdery white sand is perfect for lazying and sunbathing under the glorious heat of the Philippine sun. For adventure seekers, head to Anda and explore its chain of cave pools. Its most visited one is the Cabagnow Cave Pool, reminiscent of the Tulum Cenote in the Yucatan Peninsula of Mexico. The only difference is that Anda is less crowded and this once sleepy town is home to friendly locals. If you’re the type of traveller who is on a look-out for all things beautiful in every nook and cranny, the Philippines won’t disappoint. 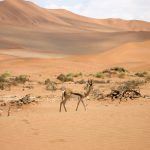 With its numerous unkempt beaches, spectacular sunsets and friendly locals. A friendly tip: visit during the summer season (March-May) to enjoy what it truly offers. By Jessa Ann Gomez. A summer girl from the tropical Philippines. Full time lawyer by profession, part-time travel writer by passion.